Home Food & Cooking Healthy Eating Meat Industry Is Under Attack: Is It Really Time to Ditch Meat? Meat Industry Is Under Attack: Is It Really Time to Ditch Meat? Going meat-free is a trend. But now that vegan meats are stealing the spotlight, is the meat industry under attack? It seems we have a meat war on our hands. And there’s a good chance that the underdog, vegan meat, is going to come out victorious. Here’s what’s happening. What are vegan or clean “meats”? For millennia, humans have been eating meat – the flesh of an animal. But now scientists are challenging this eternal truth. Does meat have to come from an animal? Thanks to the research of various food companies, it turns out that you can have a juicy, succulent burger without any animal behind it. It might seem hard to believe, but vegan meats and clean meats are not only a thing, but to many taste-testers, they’re a very good thing. 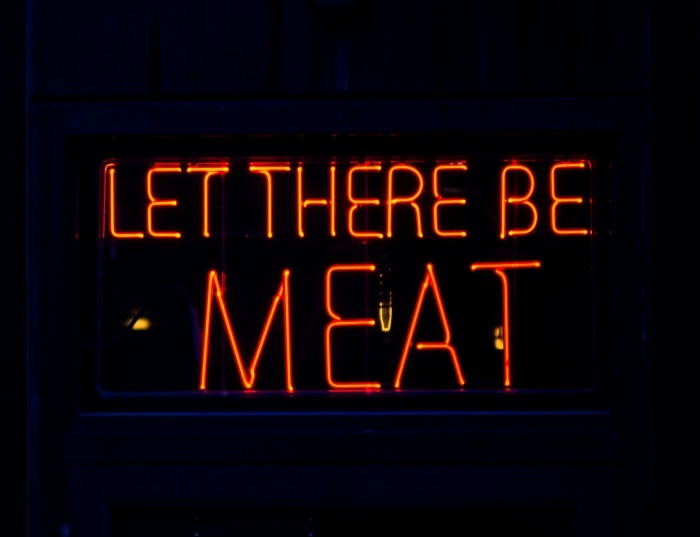 Vegan meats are plant-based, using ingredients like yeast extract, coconut oil, peas, and beets. At least, that’s how the burger produced by Beyond Meat is made. A company called Impossible Burger, instead, makes a burger using wheat, coconut oil, potatoes and a special ingredient called heme to give meat the blood, meaty feel. Then, there’s lab-grown, or clean “meat”, which is made by taking cells from live animals and growing them in a lab setting until you end up with a viable piece of meat. The animals are not harmed in the cell extraction process. Cells are then cultured and allowed to grow. Researchers feed these cells nutrients, like water, fats, proteins, sugars, vitamins, and minerals – essentially giving them the same diet a cow would eat. When the cells have grown to a large enough size, the meat is “harvested,” rather than “butchered,” and it can be sold in stores or restaurants. In a way, clean meat creates meat the same way it occurs inside the animal, except the researchers have moved the process outside the animal. Primal Spirit Foods - Misc. Are vegan and clean meats better than real meat? There are many ways to look at clean meats in comparison to their animal-based counterpart. Let’s look at four major issues: environment, animal health, human health, and taste. One of the biggest differences is that clean, vegan meats are much more environmentally friendly. According to the United Nations Food and Agriculture Organization, beef production makes up 65 percent of all livestock emissions. This comes to about 7.1 gigatonnes around the world. Emissions are only one downside to beef production. Cultivating beef takes four times as much land as dairy production, and you need up to seven times more resources for beef production, compared to pork and poultry. Facts like these, from the International Food Policy Research Institute, make it clear that beef is a big deal, and also a big problem. Animals raised solely for human consumption often live miserable lives, crowded into unclean facilities, eating diets their bodies aren’t designed for, receiving medications that nature never intended, and being treated and killed in inhumane ways. Surely, we can do better than this, and this is one of the driving forces from animal rights movements, like PETA, to have vegan and clean meats on the table, instead of beef. Animal health isn’t the only thing under attack in the beef industry. Human health is, too. The U.S. Department of Agriculture estimated that the average consumer would consume 222.2 pounds of red meat or poultry in 2018 alone. There are health risks of eating a diet high in meats, along with fats, and refined carbs (the Standard American Diet). These health risks include cardiovascular disease, obesity, type 2 diabetes, cancer and more. But beef production also includes problems like food poisoning and food-borne illnesses. This is not to say that all red meat is deleterious to your health. It’s not. But the meat you find packaged up in the grocery store has dire beginnings and can have dire endings, too. Plus, when people eat such high amounts of it, along with refined carbohydrates – as we do – it’s a surefire way to negatively impact health and wellbeing. People who have tried the vegan burgers from companies like, Impossible Foods and Beyond Meats, are shocked at how good vegan beef is – and how similar it is, in both taste and texture, to regular beef. Back in 2008, the animal rights organization, PETA, offered $1 million to the first research scientist who could create chicken meat with chicken cells. This was a huge endeavor and cost a bit more and took a bit longer than PETA expected. Research is still underway, but the interest in lab-grown meats isn’t slowing down. Instead, it seems to be gaining traction. In 2017, China signed a meaty deal – $300 million, to be precise – with three clean meat companies, called SuperMeat, Future Meat Technologies, and Meat the Future. Meanwhile, American companies like Impossible Food and Beyond Meat continue to move forward, getting funds from the likes of Bill Gates, Leonardo DiCaprio, Tyson Foods, Twitter co-founders, and even the former CEO of McDonald’s. In short, people are interested in clean meats and vegan meats. And this is something the beef industry must contend with. In 2018, the U.S. Cattleman’s Association (USCA), filed a petition with the U.S Department of Agriculture, on behalf of the cattle industry. What did their petition entail? This sort of initiative is nothing new. France has passed legislation stating that plant-based food products cannot use the words: steak, chops, ribs or burgers. The same is true in Missouri, one of the biggest producers of beef in the U.S., where lawmakers banned the use of animal-related terms on fake meat. But will that really change much? Without a doubt, marketing campaigns are already hard at work coming up with catchy, clever and convincing terms that consumers will trust. Sure, ground “beef” won’t say “ground beef”, but that doesn’t necessarily keep informed and conscientious shoppers from looking for, and investing in, clean and/or vegan meats. Next articleIs Being a Hopeless Romantic a Bad Thing?